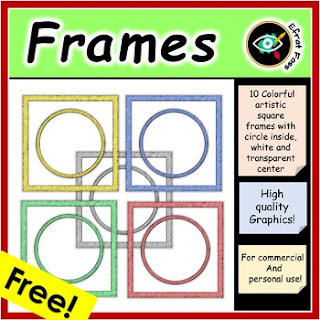 My free, colorful, artistic, square frames and borders are designed especially for teachers use. Use my clipart for your teaching resources in your classroom, TPT, blog or website.High quality graphics. 5 colorful square Frames with white fill in PNG file format. 5 colorful square Frames with circle inside without fill in PNG format. 5 colorful square Frames with circle inside with white fill in JPG format. All Graphics may be used for commercial and/or personal use. If used in a commercial product, credit must be given to Efrat Fass by providing a link back to my TpT store. In the zip file you can find my logo. Please remember to leave feedback !! Tags: free clipart, free borders, free frames, colorful frames, colorful borders, commercial use border, graphics, design elements, cover pages, for TPT sellers, greeting cards, backgrounds, task cards, class décor.